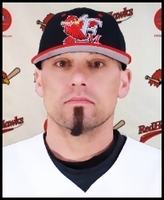 Lopez originally joined the RedHawks in 2001 as a bullpen catcher and worked for the club through the 2010 season. Lopez worked home games for the RedHawks during the 2013 season before going back on full-time duty in 2014. He has also served as the RedHawks emergency catcher and appeared in three games in his long tenure with the club. He was a college coach for the MSU-Moorhead Dragons club baseball team from 2004-2007 before leaving to become an assistant coach and recruiting coordinator for Dakota State (SD) University from 2007-2009. After relocating to California, Lopez coached with the NorCal Grizzlies travel baseball program in the Oakland area, and also coached at St. Mary’s High School in Berkeley, CA in 2011. Lopez grew up in West Fargo, ND and played Legion baseball for the West Fargo Aces and West Fargo Patriots. He played college baseball at Dickinson (ND) State University and the University of South Dakota and also attended Mayville (ND) State University. He was a two-time NDCAC All-Conference honorable mention selection at DSU as a freshman and sophomore.